These three exhibitions were part of the Getty initiative Pacific Standard Time: LA/LA (Los Angeles/Latin America). While all three had overlapping content that included early California art, they were each quite different in approach and effect. Nevertheless, they shared a common underlying message about cultural coexistence that is welcome in these times. 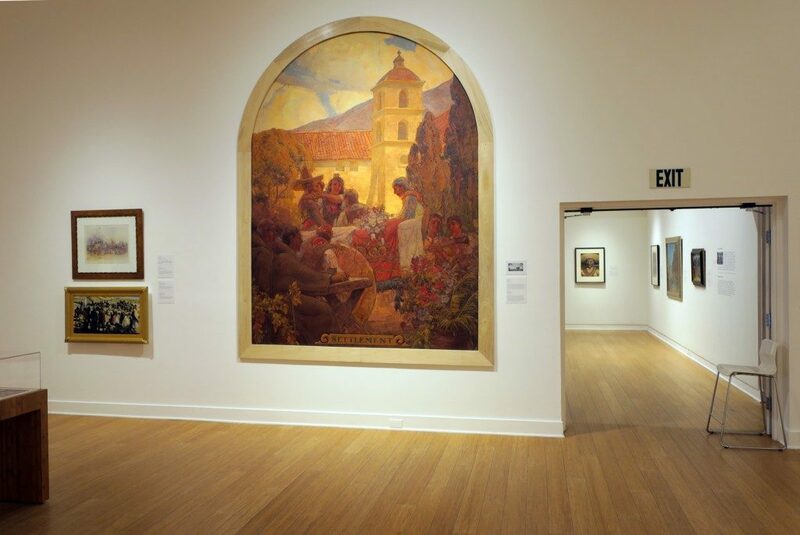 The most orthodox art exhibition of the three, and the one that began with the oldest objects, was California Mexicana: Missions to Murals, 1820–1930 at the Laguna Art Museum. Guest curated by Katherine Manthorne of the Graduate Center, City University of New York, and Alberto Nulman of Universidad Nacional Autónoma de Mexico, the exhibition filled the upper floors of the museum with just over one hundred objects, including chiefly paintings and drawings, along with some prints, printed matter, and a small selection of projected silent movies (fig. 1). The goal was to trace the evolution of visual art in California as it evolved from a Mexican territory to modern California, keeping a focus on the continuing presence of Mexican and Hispanic culture as the state became part of the United States. By stressing the continuities between Mexican and Anglo-dominated California, the exhibition offered a revisionist reading of the history of California art. The initial subdivision of the show—Mission Life—passed rather quickly over this period, which was coming to a close in any case during the initial decades this exhibition covers. The section devoted to the middle years of the nineteenth century—War, Gold, Statehood— focused on traveler-artists, such as Louis Choris and Carl Nebel, who documented carefully selected versions of the costumes and customs of Mexican-Californians. The show then moved to art concerning the war that wrenched California away from Mexico in 1848. Here we saw battle scenes and maps, most of them by non-Mexican artists. A standout here was the Richard Caton Woodville’s 1849 narrative genre painting Old ’76 and Young ’48 (The Walters Art Museum), which illustrates the connection that many imperialist-minded Americans made between the recent war with Mexico and the American Revolution. The next two sections—Mission Romance and Ranchos and Vaqueros—were visually rich and suitably multicultural, featuring paintings and prints by North American, Mexican, and Hispano-Californian artists. It was indeed refreshing to see works by Ralph Albert Blakelock, Jules Tavernier, and Fortunato Arriola—all of whom painted the California landscape—side by side, for example. These sections also pointed out the perhaps inevitable limits to a truly revisionist art history of California, because these and most other artists at that time trafficked in the sort of nostalgic exoticism and stereotyping of indigenous people that remains a stumbling block to contemporary appreciation of these works. Included here were two 1910 silent movies by D. W. Griffith, In Old California and Ramona, along with excerpts from The Mark of Zorro from 1920 and another Ramona from 1928, starring Dolores del Rio in an early role. The literary characters Zorro and Ramona were wildly popular over many decades, and they reinforced many stereotypes regarding nineteenth-century California. Their inclusion here was a worthwhile effort to at least document the roots of those cultural tropes. Those sections formed the central core of the exhibition and demonstrated most clearly both its advantages and disadvantages. On the positive side, the curators did demonstrate a new openness to considering cross-border influences on art in California, and they prove that such influence is stronger than is often admitted. Yet the art, with its often stereotypical depictions of mission life, Native American people, bandits, and vaqueros, probably needed more contextual grounding than it received here. The penultimate sections of the exhibition—Pan-American Picturesque and Nature’s Bounty—made a case that landscape artists who worked in the West often ignored the border, painting both Mexican and North American subjects. The exhibition presented several of these artists, including Samuel Colman, Thomas Moran, and Frederic Remington, among others, painting Mexican subjects that support the central emphasis of this presentation. The concluding section, Cross-Border Modernism, begins with art that was exhibited in the art pavilions at the Panama-California Exposition of 1915 to 1917 in San Diego, and the Panama-Pacific International Exposition of 1915 in San Francisco. Early modern Tonalism is positioned here as a multicultural movement, as some of its advocates, such as Xavier Martínez and Manuel Palencia, were Latino. Of course, the ultimate cross-border influence on California art came from the Mexican muralists, and that movement closed the show with nine works by as many artists. Diego Rivera was represented by a study for his 1931 mural on California life that he created for the Pacific Stock Exchange; David Alfaro Siqueiros by a 1930 lithograph depicting Emiliano Zapata. José Clemente Orozco, who also worked in California, was regrettably absent. California artists who were influenced by the Mexicans, including Maxine Albro, Henrietta Shore, and Everett Gee Jackson, concluded the exhibition. Much of the needed context for the works in this exhibition comes in the catalogue, in the form of critical essays by the curators, who ably deconstruct the cultural complexities of cross-border fertilization tainted with imperialism. Yet the catalogue illustrates many works and artists that were not included in the exhibition, and about one quarter of the works in the exhibition are not illustrated or discussed in the catalogue. This is an unusual disjunction, but one that should drive readers to acquire the book because it is more complete and theoretically grounded than the exhibition. 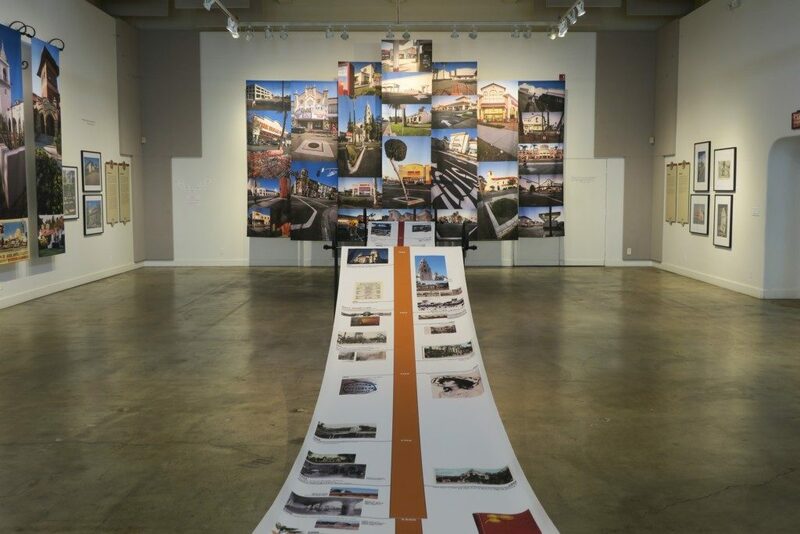 More critical background was supplied by Myth and Mirage at the Riverside Art Museum, which made the interesting claim that inland Southern California was the birthplace of the Spanish Colonial Revival architectural style. Divided equally between two moderate-sized galleries, the exhibition ushered viewers through a round mesh arch to encounter “We create the mythology” inscribed in large type on a wall. This room showed the genesis of the style in twenty-four photographs, a handful of architectural plans, seven pieces of period furniture, and a set of orange-crate labels that seem practically obligatory for an exhibition such as this. Spanish Colonial Revival, or SCR, as the curators abbreviate it, was a late nineteenth-century outgrowth of the earlier and less ornate Mission Revival. SCR was born, according to this exhibition, in the final years of the nineteenth century at the Mission Inn in Riverside, where owner Frank Miller began a massive remodeling and expansion campaign. He added arcades, towers, a chapel, and new wings of rooms, all encrusted with an eclectic mix of decorative elements from Mission, Romanesque, Spanish and Mexican Baroque, Arts and Crafts, and Mudéjar styles (the latter called Moorish here). It was an overt attempt to call up the “romance” of early California, as implanted by Helen Hunt Jackson’s novel Ramona (1884) and the preservationist advocacy of Charles Fletcher Lummis on behalf of the missions. The Riverside region was ready for this, made wealthy by railroad tourism and the export of oranges. The Mission Inn heavily influenced architecture in the city for the next twenty-five years, including the Municipal Auditorium, the First Congregational Church, and the Carnegie Library, all of which are located within three blocks of the museum. This proximity made all of these buildings an excellent and even necessary adjunct to the museum displays. The exhibition and the catalogue both clearly point out that SCR was a heady concoction, a romanticized reading of history, that papered over and silenced both Mexican and indigenous voices. The novel Ramona makes an appearance in this exhibition as well in some promotional material, as it romanticized the mission period and birthed annual dramatic reenactments that thousands attended for many years thereafter. The name Spanish Colonial Revival itself symbolized the fate of the subject Mexican and Native American people in Anglo-dominated Southern California. The buildings of the 1915 Panama-California Exposition in San Diego canonized the style and ensured its spread across California. This dissemination is the principal subject of the second large hall in the exhibition, which marched under the inscribed text “The Mythology creates us,” paraphrasing Winston Churchill’s famous 1943 statement “We shape our buildings and afterwards our buildings shape us.” An illustrated timeline ran down the center of this gallery, bearing photographs of buildings from the intervening decades (fig. 2). The timeline exploded on the end wall into a large array of contemporary buildings that use SCR motifs. Nearly every kind of building in the state has partaken of some element of SCR, including homes, bowling alleys, libraries, shopping malls, drugstores, universities, and of course the hundreds of branches of the Taco Bell fast food restaurant, founded in Downey, California, in 1962 by Frank Bell. Just as the first gallery encouraged visitors to walk outside, this gallery also successfully encouraged a closer and more critical look at today’s general visual environment. Did all of this cultural flood originate in Riverside, as this exhibition claims? It depends on how decisively you separate SCR from Mission Revival and Spanish Revival. Mission Revival began with the restoration of the actual mission buildings and gained notable national presence in the California Building by San Franciscan Arthur Page Brown at the 1893 World’s Columbian Exposition in Chicago. Spanish Revival has a parallel pedigree in St. Augustine, Florida, where Carrère and Hastings built two hotels in the 1880s, the Ponce de Leon and the Alcazar, which probably influenced the Mission Inn. Yet SCR is more ornate, eclectic, and yes, romantic than its predecessors, and some of its earliest core buildings are located in Riverside County, which in 1895 had the highest per capita income in the United States. The later manifestations of SCR in 1920s Santa Barbara, led by the designs of George Washington Smith, show influence from both Riverside and San Diego. The Los Angeles County Museum of Art (LACMA) exhibition Found in Translation: Design in California and Mexico 1915–1985 is by far the largest of the three under review here, with 255 objects, and it enacted a fruitful dialogue with both of the others. The first part of this exhibition, Spanish Colonial Inspiration, presented a different, but not mutually exclusive, emphasis on San Diego as the cradle of SCR, following on the Mission Revival. The catalogue mentions the Mission Inn but not the other Riverside County buildings, while agreeing with the Riverside exhibition in underlining tourism and eclectic fantasy as bases for the style. The LACMA exhibition also places more emphasis on Santa Barbara as a capital of SCR in the late 1920s before usefully heading back to Mexico to show how SCR even influenced architects south of the border to create a style known locally as Colonial Californiano. The LACMA show is also more expansive on California SCR, taking detours into the homes of Cliff May and the impact of colorful San Diego-made Mexican-style tilework across the region. Found in Translation was a large and somewhat ungainly exhibition, including objects in many media, such as painting, wire sculpture, furniture, textiles, storage dishes, architectural drawings, and even an upright piano encrusted with carved Neo-Zapotec motifs. However, it made an almost overwhelming case for nearly constant cultural interchange across the border. After Spanish Colonial, the story moved to indigenous revivals, where photos of the 1934 Aztec Brewing Company of San Diego held court alongside drawings of the 1924 Frank Lloyd Wright Ennis House. Siqueiros made an appearance here as well, in a preparatory drawing for his 1932 mural America Tropical. The section concluded with pre-Hispanic Mexican motifs in the posters of the Chicano movement. The third section, on folk art, featured furniture, jewelry, and textiles made mostly in California by crafters and artists who looked southward for inspiration. Included here was the abstract wire sculpture of Ruth Asawa, which was apparently influenced by concentric sets of ceramic folk pottery. Another standout was Los Angeles luminary Ken Price, whose ironic quotations of folk art in his 1977 Happy’s Curios store shelves added a note of humor. Edward Weston appeared here in a different interpretation from his work seen in California Mexicana. At LACMA, the emphasis was on the formal aspects of his photographs of Mexican ceramic jars, while at Laguna, we saw his less formally interesting portraits of Diego Rivera and Tina Modotti. The final section, on modernism, was the most expansive and in some ways the most important. It demonstrated how modern architecture in California by Richard Neutra and others influenced the work of Max Cetto and Luis Barragán in the 1940s suburb Jardines del Pedregal, near Mexico City, while A. Quincy Jones’s 1966 Sunnylands in Palm Springs used pre-Hispanic Mexican motifs. Millard Sheets and Diego Rivera both figure here with mural studies, as they did in California Mexicana. Sheets was influenced by Siqueiros, whom he invited to teach mural techniques at the Chouinard Art School in 1932. 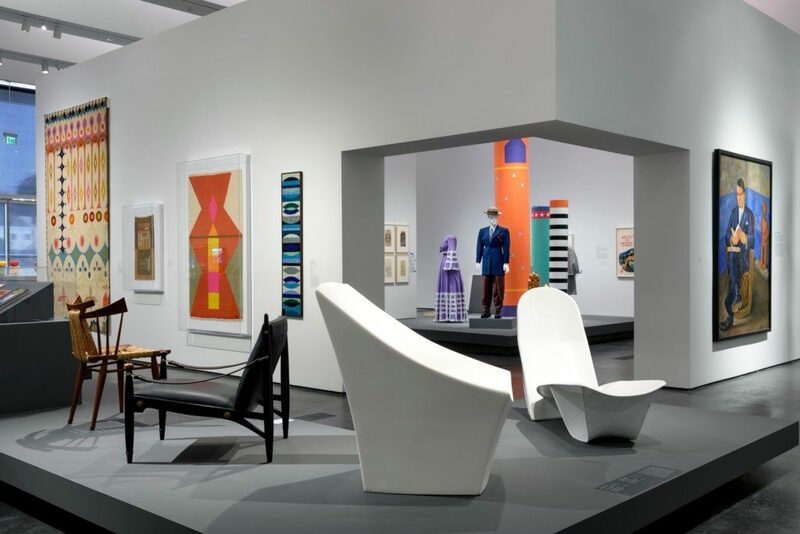 Among the many surprises in the exhibition was the white fiberglass furniture by Douglas Deeds from the 1960s, which influenced the boldly shaped white plastic seats of Pu Shun Leong, a British-born Chinese resident of Mexico City (fig. 3). One of the most curious exhibition artifacts of cross-border cultural fertilization was a video of Raquel Welch and a corps of dancers dressed as astronauts, performing “California Dreamin’” before Herbert Bayer’s monumental abstract sculpture Articulated Wall in Mexico City in 1970 and “Aquarius/Let the Sunshine In” at Teotihuacan, both as parts of a television special, years before Welch revealed her Latin American ancestry. The Bayer work had been erected for the Mexico City Olympic Games in 1968, and the exhibition includes many items designed for that event, making the credible case that the Mexico 1968 Olympics influenced the designers who created work for the Los Angeles Olympics in 1984. This is one of many fascinating juxtapositions in this wide-ranging and ambitious exhibition, which could serve as an important source of ideas for more focused curatorial projects in the future. By seeming to disregard the California-Mexico border, all three of these exhibitions performed a valuable service and opened new viewpoints. Their message of cross-border fertilization is especially welcome at a time when some powerful public officials are talking about building new walls. Cite this article: Patrick Frank, review of California Mexicana: Missions to Murals, 1820–1930 (Laguna Art Museum), Myth and Mirage: Inland Southern California, Birthplace of the Spanish Colonial Revival (Riverside Art Museum), and Found in Translation: Design in California and Mexico, 1915–1985 (Los Angeles County Museum of Art), Panorama: Journal of the Association of Historians of American Art 4, no. 1 (Spring 2018), https://doi.org/10.24926/24716839.1650. About the Author(s): Patrick Frank is an independent author.